A number of letters from Lord Freud have come to the attention of DPAC, some sent as part of the briefing to peers about Welfare Reform (namely Welfare Reform and Work Bill Policy Brief addendum Clauses 13 & 14 http://data.parliament.uk/DepositedPapers/Files/DEP2015-1009/151203_Peers_Briefing_Addendum_-_Clauses_13_and_14.pdf ) and others responding to the Lords’ questions and concerns. DPAC feels that some issues were not fully addressed and wishes to add its contributions to Monday’s debate. Lord Freud quotes 2 sentences from a 2005 OECD report which looks at In-Work Benefits (rather than out of work benefits), and which never mentions disabled people or disability. From these 2 sentences, Lord Freud extrapolates the report’s findings to disabled people. It would have been better to use the 2014 OECD report Connecting People with Jobs: Activation Policies in the United Kingdom which looks at the Work Programme (WP) and specifically at the WP’s poor work outcomes for New ESA Claimants. Apart from recommending improved interventions by providers, the report suggests that ‘an improved WCA process may help better identified claimants where a 3-6 months prognosis is justified, thus increasing the average health level of this group’ (page 214). In other terms, what the OECD report says is that New ESA Claimants, who for the purpose of the WP are split into 2 groups (one group with a 12 month prognosis and the other excluding 12 month prognosis), have been wrongly assessed as to their readiness to work. This is supported by DWP’s own statistics. 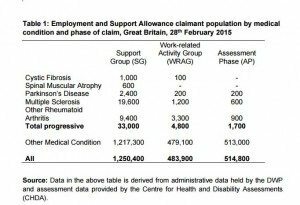 As can be seen, 2,600 claimants with MS were placed in the WRAG, of whom 1,800 had a prognosis up to 12 months, and would have been referred to the WP. So between October 2008 and June 2015, only 100 claimants with MS were found fit for work at repeat assessment, although they had been placed in the WRAG, 900 of them with a 3-6 months prognosis. These 1,800 claimants, with a prognosis up to 12 months, represents 5.5%, which is in line with the performance of the WP for New ESA Claimants. It is likely that most claimants would have subsquently been moved into the Support Group, where they should have been placed at initial assessment if they had been correctly assessed. This question was asked of DWP, through a FOI request, to which it did not respond. But it shows that the WCA is failing to properly assess claimants’ capacity for work, and that in the WRAG there are people who have very severe illnesses or disabilities. These are the people who from next year are expected to survive on the same income as JSA claimants, without recognition of the extra costs (transport, heating, diet etc.) associated with disability. So following Lord Freud’s reasoning that low benefits help to move benefit claimants into work, the UK should have the highest number of disabled people moving into work. This is not the case. The government is exploiting the failings of the WCA against disabled people to justify cutting their benefits. DPAC recognises, as does Lord Freud, that ‘suicide is a tragic and complex issue’. Lord Freud concludes ‘Whilst any death is extremely distressing for the family no causal link whatsoever can be made between the likelihood of dying and the fact that someone is claiming benefits’. It is very difficult in these circumstances to establish a causal link between the likelihood of dying and claiming benefits, but 2 Coroners wrote Preventable Future Deaths Reports explicitly linking the fact that the 2 persons who committed suicide had been found fit for work and lost their benefits. 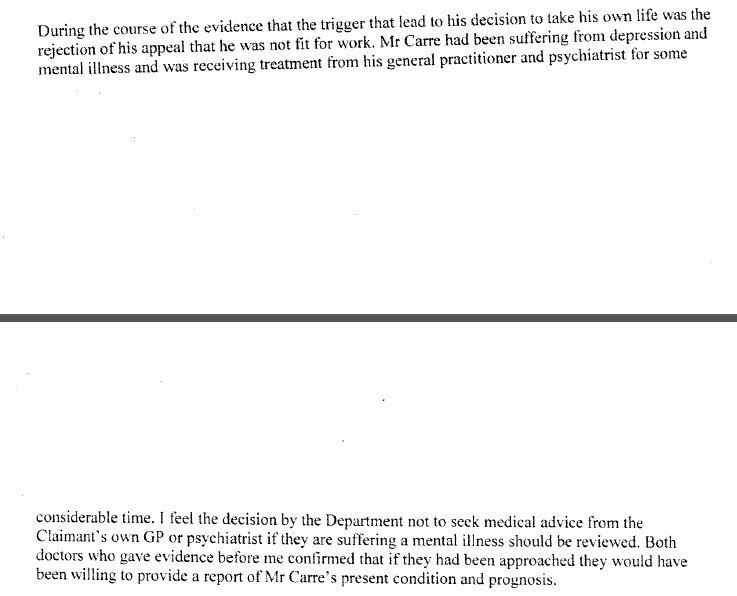 The second report in January 2014 also states that being found fit for work was the trigger for suicide. Many other coroners have cited the WCA and WCA outcomes as contributing factors in ESA claimant suicides, although they have not gone as far as writing a Preventable Deaths Report. 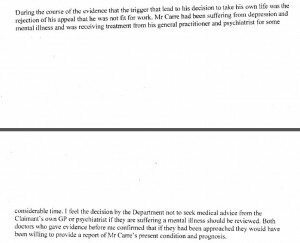 Finally, it has come to light that DWP has conducted 49 peer reviews into claimant’s suicides. Although DWP refuses to disclose anything about these peer reviews, their Terms of Reference indicate that they only ascertain whether the right procedures were followed. A responsible and accountable government would want to immediately open a public inquiry into suicides linked to the Welfare Reform. DPAC thanks you in advance for taking the time to read this submission, which will hopefully inform Monday’s debate. Perhaps he should be called Lord Fraud!